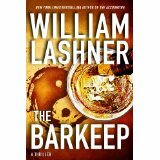 Taking a little break from horror books ….. Been reading a mystery suspense book…… THE BARKEEP by William Lashner. Great book so far. I’m on the last 25%. The book takes you on a ride of a lifetime …. you are following a barkeep by the name of Justin, who is after what seems like a lifetime ago, trying to find out who killed his mother. Was it his dad, who is serving a prison term and trying to get a new trial. The sly and not so sly characters you will meet through-out this book. You will feel Justin’s pain, this confusion, and his hope. Looking forward to finding out the truth with Justin….. will the truth be what Justin is looking for, what he wants. Will it be what I’m looking for, what truth I want ??? Will have to keep reading and find out!! Coming up in June is our JUNE AUTHOR SPOTLIGHT …. omg! I’m really looking forward to telling you all about this exciting author ………… DAVID M. SALKIN. This is a man of many talents … and I still haven’t figured out how he finds the time to write! David writes many styles of books. He writes to entertain! That he does! 🙂 David’s book, HARD CARBON was my #1 book of last year. Thriller from start to finish. Murder, mystery and mayhem!! Diamonds, the Russian mafia! Took my breath away. Be sure to check it out. Be sure to check out all of David M. Salkin’s books! !